2Monégasque and Italian also spoken widely. The Principality of Monaco (French: Principauté de Monaco; Monégasque: Principatu de Múnegu; Occitan: Principat de Mónegue; Italian: Principato di Monaco), more commonly known as Monaco, is a constitutional monarchy and city-state in Western Europe located along the French Riviera between the Mediterranean Sea and France. Affluent Monaco is one of five European microstates. Monaco is the most densely populated country in the world and the world's second-smallest independent country, with a population of just 32,410 and an area of 1.95 square kilometers (481.9 acres). It has more millionaires per capita than any other country in the world. It is the smallest French-speaking country in the world. The Principality of Monaco is the second-smallest independent state in the world, after Vatican City. It is located on the Mediterranean coast, 18 kilometers (11 mi) east of Nice and near the Italian border. It is surrounded on three sides by the Provence-Alpes-Côte d'Azur Région of France. It consists of a narrow strip along the coast at the bottom of the foothills of the Alps and its highest point is "Le Rocher" at 140 meters (459 ft). The principality is noted for its natural scenery and mild, sunny climate. The average minimum temperature in January and February is 8 ° C (47 ° F); in July and August the average maximum temperature is 26 °C (78 °F). Monaco is a narrow coastal strip. Its physical geography includes a long beach which accounts for a vast part of Monaco's border, and steep cliffs that rise vertically upwards to heights of 63 meters (206 ft) above sea level. Monaco is divided into four quarters (quartiers): Monaco-Ville, the old city on a rocky promontory extending into the Mediterranean, known as the Rock of Monaco; La Condamine, the northwest section including the port area; Monte Carlo, the principal residential and resort area with the casino in the east; and Fontvieille, a newly constructed area reclaimed from the sea. La Condamine quartier is further subdivided into La Condamine proper (the port area); Moneghetti; Les Revoires, containing the Jardin Exotique; and La Colle, on the western border with Cap d`Ail. Monte Carlo quartier is also subdivided into several neighborhoods: Monte Carlo proper (the casino and resort area); Larvotto, a beach area to the east of the principality; Saint Roman/ Tenao on the northeast corner; and the central residential area of Saint Michel. Monaco apparently first gained its name from the nearby Phocaean Greek colony of Marseille, in the 6th century BC, which referred to the Ligurians as Monoikos, from the Greek Μόνοικος — μόνος + οίκος, "single house", which bears the sense of a people either settled in a "single habitation" or of "living apart" from others. According to an ancient myth, Hercules passed through the Monaco area. A temple was constructed there by Phoceans, the temple of Hercules Monoikos. From 1793 to 1814, Monaco was under French control. 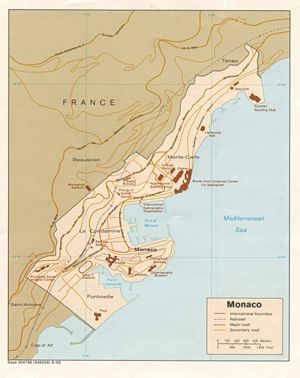 The Congress of Vienna designated Monaco as a protectorate of the Kingdom of Sardinia from 1815 until 1860 when the Treaty of Turin ceded to France the surrounding county of Nice (as well as Savoy). During this time there was unrest in the towns of Menton and Roquebrune, which declared independence, hoping for annexation by Sardinia. The unrest continued until the ruling prince gave up his claim to the two towns (some 95% of the country) to France in return for 4 million francs. This transfer and Monaco's sovereignty was recognised by the Franco-Monegasque Treaty of 1861. Until the 1911 constitution, the princes of Monaco ruled absolutely. In July 1918, a treaty was signed providing for limited French protection over Monaco. The treaty, part of the Treaty of Versailles, established that Monegasque policy would be aligned with French political, military, and economic interests. Rainier III, Prince of Monaco acceded to the throne following the death of his grandfather, Prince Louis II, in 1949. A new constitution, proclaimed in 1962, abolished capital punishment, provided for women's suffrage, and established a Supreme Court to guarantee fundamental liberties. In 1993, Monaco became a member of the United Nations, with full voting rights. In 2002, a new treaty between France and Monaco clarifies that if there are no heirs to carry on the dynasty, the principality will remain an independent nation rather than revert to France. Monaco's military defence, however, is still the responsibility of France. Prince Albert, Marquis of Baux took over the royal duties on 31 March 2005, because his father Prince Rainier III was too ill to exercise his royal functions. On 6 April 2005, Prince Rainier died and his son succeeded him as Albert II of Monaco. Prince Albert II of Monaco formally became the ruler of Monaco on 12 July 2005, in a celebration that began with a solemn Mass at the cathedral where his father was buried three months before, after a reign of 56 years. His accession to the throne was a two-step event with another ceremony drawing heads of state for an elaborate ceremony held on 19 November 2005. He is the son of the late actress and princess Grace Kelly. Monaco has been governed as a constitutional monarchy since 1911, with the Sovereign Prince of Monaco as head of state. The executive branch consists of a Minister of State (the head of government), who presides over a four-member Council of Government (the Cabinet). The minister of state is a French citizen appointed by the prince from among candidates proposed by the French government. Under the 1962 constitution, the prince shares his power with the unicameral National Council (parliament). The 24 members of this legislative body are elected from lists by universal suffrage for five-year terms. The principality's local affairs are directed by the Communal Council, which consists of 15 elected members and is presided over by the mayor. Monaco received its first ambassador from abroad on 16 February 2006, from France. This is despite having had representation abroad and in the United Nations for many years. On both a per-capita and per-area basis, Monaco has the largest police force and police presence in the world. The Compagnie des Carabiniers du Prince (Prince's Company of Carabiniers) is the military force of Monaco. Although Monaco's defence is the responsibility of France, it maintains a small force for the protection of the Sovereign Prince of Monaco. It was formed by Prince Honoré IV in 1817 for the protection of the Principality. The company numbers approximately 100 officers and men; while the NCOs and soldiers are local, the officers have generally served in the French Army. Together with the local fire service, the Caribiniers form Monaco's total public forces. In addition to their guard duties, the company patrols the Principality's beaches and coastal waters, as well as other duties around the Palace in Monaco-Ville. Monaco city and harbour view. One of Monaco's main sources of income is tourism; each year many are attracted to its casino and pleasant climate. In 2001, a major new construction project extended the pier used by cruise ships in the main harbour. The principality has successfully sought to diversify into services and small, high-value-added, non-polluting industries such as cosmetics and biothermics. As befits a world leader in glamour and money, Monaco is one of the most expensive places on Earth. The principality is often regarded as a tax haven, and most of its inhabitants are millionaires from other countries. The glamour and prestige associated with Monaco and its style-conscious people can be seen in the number of high class cars, designer fashion boutiques such as Chanel, trendy restaurants, and its royal family, especially since the marriage of Prince Rainer to Grace Kelly, later HSH Princess Grace of Monaco. The state has no income tax for individuals. The state retains monopolies in numerous sectors, including tobacco and the postal service. The telephone network used to be owned by the state; now, Monaco Telecom is 49% owned by Cable and Wireless, 45% by the state and 6% by Compagnie Monégasque de Banque, but it is still a monopoly. Living standards are high, roughly comparable to those in prosperous French metropolitan areas. 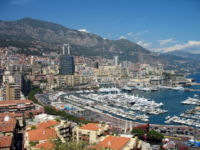 The lack of personal income tax has led to a considerable number of wealthy "tax refugee" residents from European countries, who earn the majority of their income from activity outside Monaco; celebrities like Formula One drivers attract most of the attention, but the majority of them are business people. In 2000, a report by French parliamentarians Arnaud Montebourg and Vincent Peillon alleged that Monaco has lax policies with respect to money laundering, including within its famed casino, and that the government of Monaco puts political pressure on the judiciary so that alleged crimes are not properly investigated. In response, the Government of Monaco ordered reports to OECD and the Financial Action Task Force on Money Laundering. These reports revealed most of these allegations to be untrue. Monaco is not a member of the European Union but is very closely linked to it via a customs union with France, and as such its currency is the same as France's: the euro. Prior to 2002, Monaco minted their own franc coins, the Monegasque franc. Monaco has acquired the right to mint euro coins with Monegasque designs on their national side. Monaco's major exports are chemicals, pharmaceuticals, beauty-care products, ceramics, metal works, textiles, plastics, and instruments. Monaco has ten state-operated schools, including seven nursery and primary schools, one secondary school (Collège Charles III), one lycée that provides general and technological training (Lycée Albert 1er, which compares favorably to those in neighboring southern France), and one lycée that provides vocational and hotel training. There are also two grant-aided denominational private schools (including Institution François d'Assise Nicolas Barré and Ecole des Sœurs Dominicaines) and one international school ( International School of Monaco). Monaco's population is unusual in that the native Monegasques are a minority in their own country. The largest proportion of residents are French nationals (47%), while Monegasque and Italian nationals represent 16% each, and the remaining 21% belong to one of the other 125 nationalities that make up Monaco's international population. With an average age of 45, Monaco has the highest in the world. French is the only official language, but Italian, English, and the two local languages, Monégasque (a descendant of Genoese) and Occitan, are also spoken. The literacy rate is 99%. Roman Catholicism is the official religion, with freedom of other religions guaranteed by the constitution. Monaco has no army and air force, but has a small coast guard consisting of 3 small patrol boats armed with small cannons. Security is provided by a small armed police force consisting of between 300-400 men and women. Defence of the nation is provided by France.